Portraits of Perry was a collaborative project including Iowa State University printmaking students, Perry High School students, and Perry community members and artists. The theme encouraged any interested community member to create a relief carving illustrating a "Portrait of Perry", which could range from a traditional figurative portrait to a landscape to a metaphor for their experience in the community. Iowa State hosted an instructional workshop at La Poste, a local community arts and music venue, for all interested participants in February of 2015. Additionally, we worked with Perry High School drawing class for four class sessions on the project. 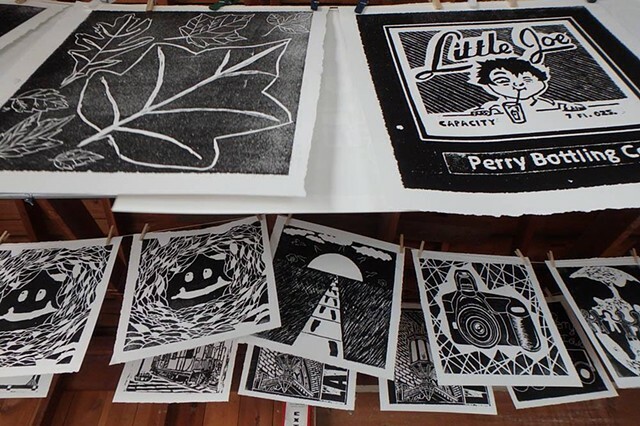 In May 2015, a public steamroller printmaking event was held on the Raccoon River Trail in downtown Perry to create prints of the carvings. The prints are being transformed into signage for downtown Perry.